I used to walk through the Capitol several times a week, on my way somewhere, maybe on an errand, or maybe just taking a walk. I loved walking through the Capitol. So beautiful. So open. Usually quiet and always having a magnificence that sang to the top of the dome and bounced back at me. I loved the feeling. It was alive. 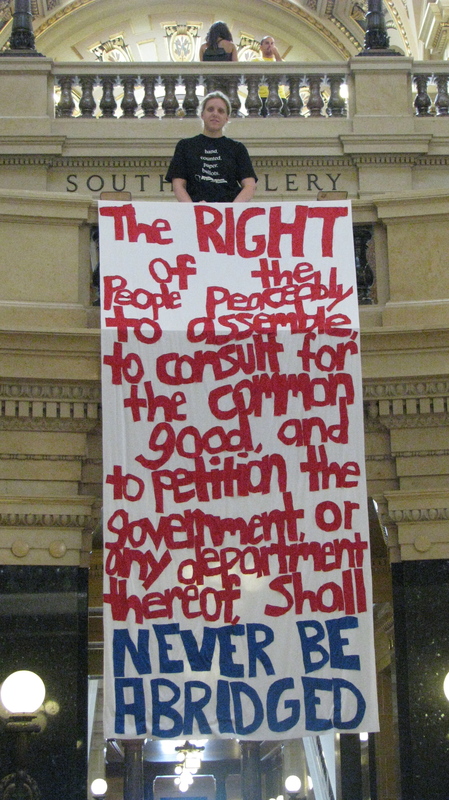 Groups performing, an individual reciting his grievances, a woman holding a sign, a child looking in wonder at the dome. Even then I thought, this is my house, this belongs to me, I am part of the people that this building represents. My great, great grandfather served in the building that this building replaced. Representative George Paris Thompson, Pine Bluff. My cousin served in the current Capitol building, Representative Robert M. Thompson, Poynette. 7/04/2011 1:05. 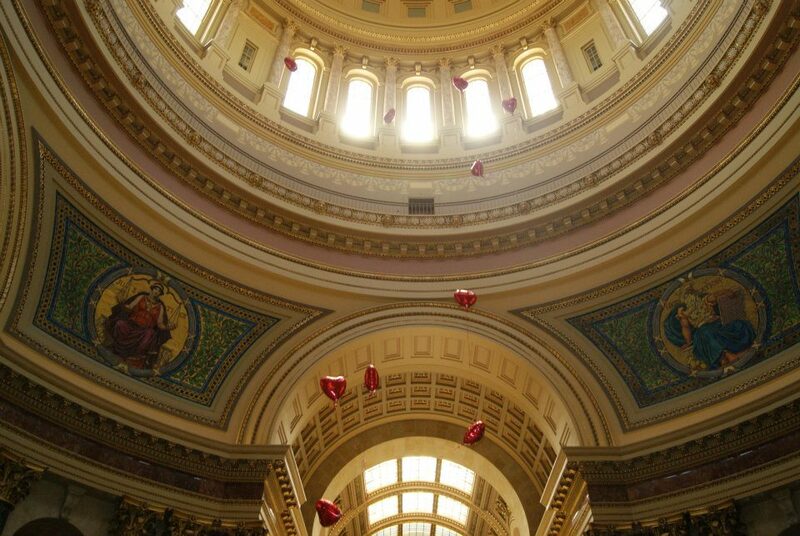 Balloon release in the Capitol Rotunda. I knew the history, theirs, the Capitols, and the state as a whole. 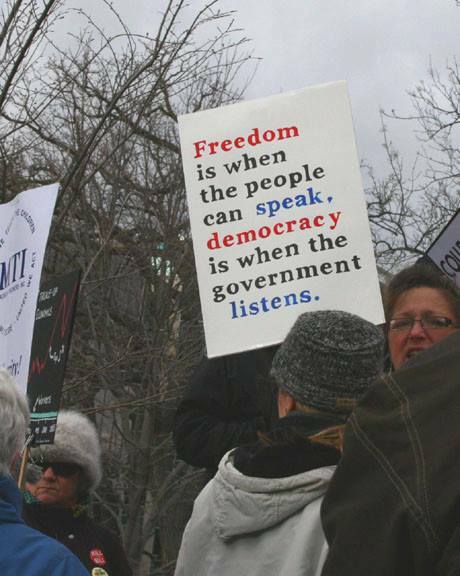 I knew the idea of the constitutions, both the U.S. and Wisconsin’s, if not the exact words. I knew the history of the state and my history, and they were intertwined. I belonged. I was completely rooted in the state of my birth and I loved it. What a heady feeling. And that’s why I used every excuse to walk through my Capitol. It was mine. It was ours. It belonged to everyone and we could enter it freely. Since those crazy days of my great, great grandfather, Wisconsin has built a rich tradition of openness and transparency and an acknowledgment that the people of this state are in control, not the politicians, not the corporations, not some unknown entity. I was always so profoundly proud of my state and what we stood for. This Capitol, the building we use today, was built with the people in mind. It was built for the people to use, for the people to visit, for the people to observe holidays, solemn days, and special days, and as a forum for the people to express their pleasure or displeasure with the government. I am a member of the Solidarity Singers, so you can add my name to your list of ‘terrorists’ if it is not already there. I am a white, silver-haired female, 64 years old, Methodist, retired, and a former Republican. 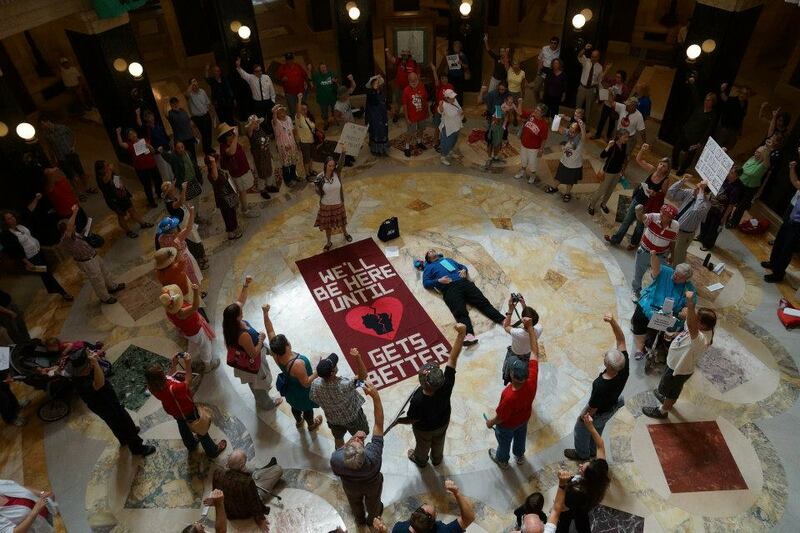 I come to the capitol when I can and sing my heart out, and usually cry. I see the police milling around the edges, always letting me know they are there, always letting me know they could cuff me, haul me down the stairs, charge me with some infraction, always there, always lurking, always reminding me of what our state has turned into during the last two and a half years. Intimidation. It is nothing but intimidation. Day after day after day. Paid for by the tax payers. Paid for by the citizens who have been given a constitutional right to express themselves openly and freely, without threat of arrest, without police officers lurking about, taking notes, glaring, intimidating. The people who come and sing every day, or almost every day, are my heroes. They are fighting for my freedom of speech. They are fighting to keep my Capitol open as a forum for expressing my beliefs, my thoughts, my feelings. I know that and I thank them at every opportunity I have. As long as you keep threatening to crush us and silence us, I know that they will be there, fighting for me. And they know that I will be there whenever I can. We are one. 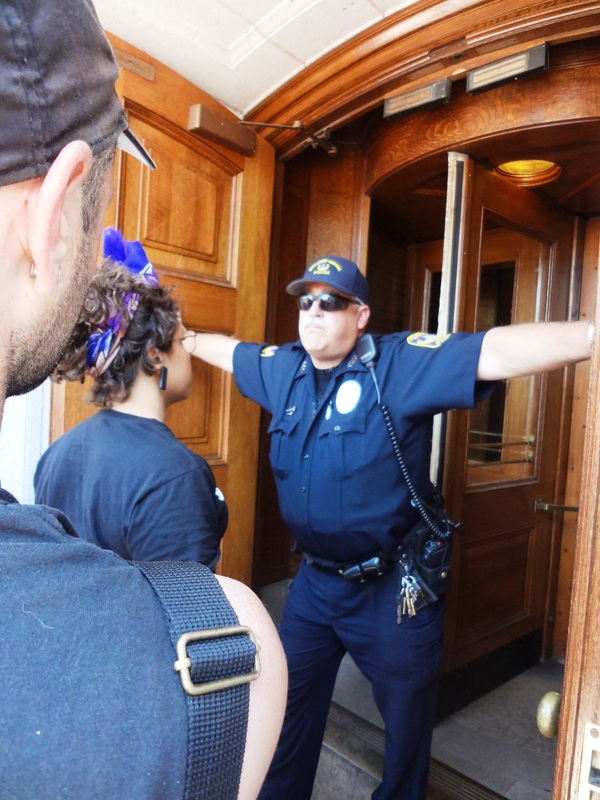 The Solidarity Singers are not a threat to the building and the people in it. The current administration is the threat, a threat to the citizens of this state. The Solidarity Singers are good people, some of the nicest, most compassionate people I have ever had the privilege of meeting. They care passionately about the Capitol, the state, the people of this state, and the rights and freedoms that we are all guaranteed. I am extremely proud to call them my friends. I believe, as the others do, that we have a fundamental right to petition our government, in our house, in our way. Our way does not threaten anyone, it does not hurt the building, it does not deny anyone else their right to use the building, to express their views, to enjoy their constitutional rights. I often sit in the Assembly or Senate gallery and bear witness to what is happening on the floor. The police presence there is unbelievable and their attitude is insulting. I am a citizen of this state, I have a right to sit in the gallery unmolested and unintimidated. But everywhere I look there are guards, police officers and pages, watching every move I make. Why? Some days I feel like I am suffocating from their presence, from their constant observation, and I am sick of it. I have a right to sit in those galleries, unmolested, and witness what is happening, without feeling intimidated. And I will admit it, I do feel intimidated now, whenever I enter my Capitol. And what a horrible feeling it is. I attended a wedding last year in the Assembly chambers. A special wedding. My niece, whom I love dearly. And I caught myself looking around, wondering where the police were, wondering if they were monitoring the wedding, wondering if the camera was zeroing in on my movements, wondering if they were taking notes, wondering how many cameras were aimed at us and how many officers were watching. And now I sit here crying, as I type these words, because I cannot believe my state has come to this. I want to scream and yell and tell you to get out of my state, leave us alone, quit threatening us, quit trying to silence our voices, quit taking away our freedoms and constitutional rights. Although I may feel intimidated every time I walk into my Capitol, I am not afraid of you. I long for the day when you and this administration are gone and the people can once again enter our Capitol without the horrible, repressive feeling of intimidation. You need to step back and look at what this administration has been doing since it came to power. It has been slowly turning the screws, putting pressure on the people, pushing them down and down and down, taking away rights, silencing them, trying to crush them. If you cannot see this then you are not a freedom-loving American. For the life of me, I do not know why I considered myself a Republican. This administration is an embarrassment, it is not representative of the Republican party that I once knew, and it is certainly not representative of the people of this state, it is an anomaly. I am against any rules that have already stifled or will further stifle the voices of the citizens of this state. I am against the rule changes proposed regarding Admin 2. Please submit the above testimony into the hearing record regarding rule changes to Adm 2.